to go to my friend Judes for a sewing day. Yeah Yeah Yeah...I'm happy dancing. Are you able to join us too? Whether your with company or on your own? be thinking of you with fondness and great memories. to get accomplished in one day. I have wishful thinking. I'm hoping to get lots sewn together. While I was getting packed my darling girls were coloring in. 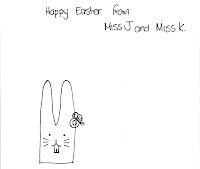 Miss J was showing Miss K how to draw Easter bunnies. Miss J thought it was a great idea too. I just added some flowers to Miss Bunny's head. What a wonderful way to spend your day! The little bunny is so cute. Happy stitching. Well it's evening here, and I'm sitting with my feet up, stitching away on a quilt - but you only posted less than an hour ago, so for the rest of the evening, I'm joining you!!!! Can you see me wave? *G* I hope you have a wonderful day, my friend. I LOVE Miss J's bunny, cute cute cute - I want to stitch it too now!!! Tell Miss J thank you VERY much, I love it! Oh - and Happy Easter!!! 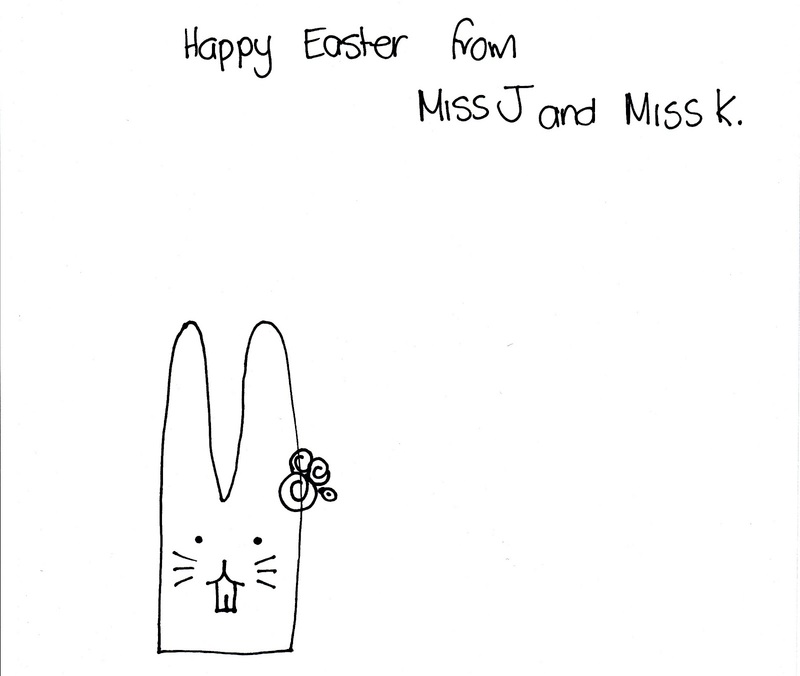 Gorgeous little bunny your girls have drawn. Have a lovely stitching day with Jude and with Fee and her friends. I am stitching alone today but joining you in my thoughts. Hope this day out will recharge your batteries for you and the infections are getting chased away. Darling bunny. The girls did good! Enjoy your stitching day with friends. Glad to hear you are feeling better. Happy Spring and Happy Easter from my home to yours. Why do I have to sign in to download this file. It is a .pdf file.